Fuel poverty, constant price hikes, billions siphoned off to shareholders - the private energy market has failed in social terms. It's time for democratic control of energy. Flickr/GAAP Studio. Some rights reserved. It is clear that Britain has an energy problem. The privatisation and ‘liberalisation’ of the energy market has left us with six dominant suppliers from which over 90% of us buy our energy. 1 in 10 households in the UK are in fuel poverty. Confidence in the ability of the biggest energy companies to act in the public interest has almost completely eroded, and the head of Ofgem has identified a ‘deep mistrust in anything the energy companies do or say’. The Big Six have faced continued criticism over widening profit margins and a perception that they abuse their dominant market position. Average pre-tax profits are expected to reach £114 per household over the next year, despite plummeting oil and gas prices. And we are categorically failing to make the necessary moves towards green sources of energy; just 5.2% of our overall energy consumption is from renewable sources, one of the lowest in the EU. Anyone can see that the system is broken. But to how fix it? What would a new energy paradigm look like? This was the topic of an inspiring workshop event, ‘Imagining Energy Democracy’, organised and chaired by Global Justice Now, and attended by a wealth of campaigners and academics. We allowed our minds to wander, to dream, to imagine an energy future not dominated by fossil fuels and large private companies, but a future in which ‘energy democracy’ had won out against corporate profit and climate destruction. Energy democracy is a concept born out of the climate justice movement, and brings together intersecting ideas grounded in social justice and the need for decisive and collective action to limit the devastating effects of climate change. It demands independence from large corporations, decentralisation, and a shift towards participatory forms of decision-making, enabling people to be involved in the economic decisions that shape their lives. It means giving everyone equal access to energy that’s affordable, and doesn’t put the future of our planet in danger. Above all it means putting the common good before private profit. All energy struggles are important for achieving this, from battling crippling fuel poverty to preventing the fracking of our countryside. But the question of ownership is critical. Energy democracy cannot be achieved without public ownership of the means of generation and distribution of energy. To break the stranglehold large private companies have on our energy, we need to produce a positive and pragmatic alternative. Public ownership, whilst vital to achieving energy democracy, is no panacea. Large state-owned corporations are still guilty of unresponsiveness and inefficiency. A re-imagining of public ownership must be diverse, and able to operate at a number of different scales. Nationally-owned organisations and infrastructure will form a vital part of this, but so will more localised forms of public ownership, through municipal or council-owned bodies, as well as small-scale co-operatives and community groups. In all cases, collective ownership must prove itself to be flexible, responsive and able to enhance democratic participation. What does the alternative look like? Many of the countries in Europe that have been the most successful to-date in implementing the transition towards renewable energy, such as Germany and Denmark, have a broad range of energy suppliers, owned by the public on a local, regional and co-operative basis. A continuing wave of ‘re-municipalisation’ in Germany has seen over 100 energy concessions brought into public ownership since 2007, such that nearly half of Germany’s renewable energy capacity is now owned by citizens. In Denmark, the country’s rapid shift towards wind power in the 1980s is credited to the decentralised and local nature of its network (80% of wind turbines are owned by families or co-operatives.) In the UK, both Nottingham and Bristol City Councils are working to set up municipal energy companies to provide fairly priced, renewable energy to their citizens. Central to Bristol’s plans is a desire to be a ‘force for social good not wholly driven by profit’, and a pledge to guarantee ‘competitive, fair and simple energy tariffs with any profits reinvested back into local communities’. It is these values, and this view of energy as a public utility, which are missing from our current system. Imbued with these values, collective ownership of our energy could also be an avenue through which to tackle some of society’s glaring inequalities. Currently, the poorest pay the most through punitive prepayment meters, which, despite the energy companies’ pledge never to ‘knowingly disconnect’, could be forcing thousands to go without electricity and gas. As well as producing savings that could be passed on to the public, a series of progressive tariffs could be established to help those least able to pay their energy bills. Proceeds could also be used to directed towards projects of social value. In Nebraska, all residents and business buy their energy from a public or community-owned institution rather than a for-profit company. Payments from these providers are used to support a variety of social services, including the public education system. Public ownership, in its multitude of forms, would give us all the ability to participate in vital decisions about how our energy is generated. Under the current regime, those who use energy are excluded from any decisions about how profits or surplus is reinvested, and the form that this investment takes. If these decisions were delegated to the public, would they opt to pour further funds into the discovery and exploitation of ever more extreme sources of fossil fuels? Or would they choose to invest in the expansion of renewables? As ‘consumers’, the only method of participation we are afforded by the market is to change suppliers. Yet many of us feel unable to exercise this power, paralysed by a byzantine number of tariffs, and a sneaking suspicion that ‘they’re all the same anyway’. In fact, recent research by consumer group Which? has estimated that the lack of competition in the energy market could have cost us £2.9 billion over the last year. Not only is corporate ownership of our energy restricting our ability to choose how our energy is generated, but it is also charging us a premium for our lack of civic power. Research carried out by We Own It and Corporate Watch calculated how much each household could save if water, energy and rail were in public ownership. Public ownership would be cheaper because there would be no need to pass on profits to shareholders, and because government can borrow more cheaply than private companies to raise money for investment. 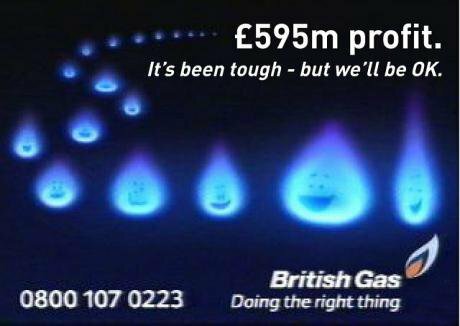 The cost of privatisation came to £248 a year, per household, of which energy comprised £160. These are likely to be conservative estimates. There is still much work to be done to counter the dominant narrative of ‘the market knows best.’ In their sharp and incisive essay 'Energy Beyond Neoliberalism' (pdf), Platform floats the idea of a nationally-owned offshore wind farm, the profits from which would be used to fund social projects and a sovereign wealth fund, inspired by Norway’s state oil fund. Public ownership of energy is undoubtedly popular (68% support it), but the fact that these sorts of discussions are not even on the national agenda points to the stilted nature of the debate, which is often falsely presented as a choice between unfettered markets or black-outs. We Own It has compared public opinion with party policy relating to privatisation and public services - and public ownership of energy is only advocated by one party - the Greens. This is not an unattainable vision of utopia, but a model that has proven to work for many of our European neighbours. Countries across the continent, often driven by grassroots campaigns, are pursuing public ownership as a way to bring down prices and fight climate change. The UK needs to follow, or risk being left behind. This article is part of our Modernise: de-privatise series.